This week you hear from Kate Gray. I met Kate in a coffee shop on Hawthorne. We were meeting to talk about riding bikes and writing books and she sat there in her kind, quiet, and unassuming manner. I’d just gotten on my first AWP panel and I was stoked about it and so I went on and on about AWP, not realizing what a big wig Kate Gray really was. Finalist for an Oregon Book Award in Poetry, winner of the Gertrude Press Poetry Prize, novelist, college professor. Kate just sat there in her contained way while I blathered like an idiot and she never let on that I was indeed such a complete and total dork (and she’s not mentioned it to this day). Then I wound up with season tickets to the Thorns and sat next to Kate and her partner. These people are serious about their soccer. There’s no chit chat when the ball is in play, so what little more I learned about Kate had to come before the game started or at halftime. That’s when we figured out we were both having books come out around the same time in 2015. Two Kates, two books, two women who loved to cycle—what were the odds? We went to each other’s readings and realized besides sharing a name, we shared a passion for language and for telling the truth. Kate’s novel, Carry the Sky, was named one of 11 must-read books set in high schools by Bustle Magazine, but that’s not why you should read it. You should read it for its lyric prose, the way Kate can set you in a scene and make you feel it like it really happened to you. You should read it because it looks at bullying and gayness and how hard it was all those years ago, and it does it all without ever being depressing. And, I’ll tell you what, that’s hope we need right now. So grab a cup and sit back and read about what Kate Gray thinks about all the mean and hard times we have faced before and how we paddled through those storms, and how we’ll paddle on now. The Authenticity Experiment, the hope for the future edition. When the scrub oak leaves around me turn brown and fall, they’re loud. I come here for quiet, seventy miles away from Portland, into the hills outside Mosier, a town in the Columbia River Gorge with few residents. Mule deer, Pileated woodpeckers, and squirrels wander through this land. Exactly the way I want it. For weeks this summer I’ve heard leaves dropping one-by-one, as loud as small balls falling. So loud I turn my head. The past few weeks have been loud with noise in the media, the worst politics has to offer. But today, Oregon is getting drenched. In front of me, the valleys of the Cascade foothills are filling with fog, rain is rushing up the slope toward me, and in no time, fog is all I see outside my windows. The quiet, inside and out, is the cathedral kind, what you find looking up those huge Gothic spires, when you want to feel a part of something bigger and better than you. With the fog in my windows and no houses nearby, this quiet takes me back to kayaking on flat water off Vancouver Island. 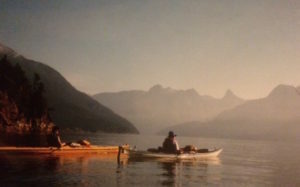 In late summer, 1999, eight women in our forties drove north from Oregon to Vancouver, BC in four pickup trucks with kayaks and dry bags crammed with vegetarian refried beans, organic coffee, evaporated milk, pens, and journals, loaded into a ferry bound for Nanaimo, midway up Vancouver Island. We drove to the west side, and the next day, we launched our kayaks for the Broken Group Islands, a week-long kayak-camping trip. When we paddled the first day, a four-hour stretch of open water, the surface of the water was silver-blue, and the sky was gray-blue, and we were the only things creating wakes. Around us, little islands with gray cliffs and broken pines punctuated the horizon. Flat line, stillness, gray-blue. Over our shoulders on one side, the horizon arced blue. Around us, a big puddle of sea. Our yellow and red kayaks, made from fancy materials, were more like tub toys than sleek vessels. Being “out there,” without the sound of cars or planes, too far from shore to swim in, no one around to pick us up if we called, is to feel connected to water, to light, to earth. The west coast of Vancouver Island is wild. Trees drip and point leeward. The shore is sparsely inhabited, except by people with enough humor and ingenuity to tuck their homes into inlets and find pleasure in ferocious wind and rain. Removing yourself from your life of grading papers and buying groceries, from other people except the ones you’ve chosen, is a pact and practice both communal and holy. That summer marked the end of the 1990s, and in Oregon, that meant a decade of the Oregon Citizens’ Alliance, right-wing radicals who fed the collective anger of people out of work, those who pinned the loss of timber and fishing industries on all things liberal, urban, gay, and government. One ballot measure after another attempted to dehumanize gay people. The first one, Ballot Measure 9, was the worst. It equated homosexuality with pedophilia, and it required teachers to tell kids that being gay was “abnormal, wrong, unnatural and perverse.” The fight to defeat the measure was bitter and dangerous. Women who drove pickups like mine were flipped off, cut off, and chased off highways. “No on 9” lawn signs were shredded and left with smashed pumpkins on lawns. Those of us rallying against Measure 9 made sure our phone numbers were unlisted, drove in caravans, never walked alone at night. At the college where I taught, the student body president was the daughter of the measure’s sponsor, Lon Mabon. And in my classes, it was my job to help supporters of the anti-gay measure shape and perfect their persuasive essays, if that’s what they chose to write about. In my women’s lit class, the one man who enrolled said that he empathized with being “other” since he was Latino, but he found homosexuality abhorrent, unnatural. I told him to look again, really look at nature, look at mallards, look at lions and impalas. All eight of us on that trip had helped defeat the Oregon Citizens’ Alliance during the 90s. Paddling with lesbians unafraid of moving in the world was more soothing than any post-election party, than any sermon or therapy. In the middle of our long paddle that day, we spotted two heads. Bird heads. Live birds, floating, making no wake. We hadn’t seen any birds in the two hours of paddling beneath the sky the same color as the water. Each bird’s markings was completely different from the other’s. Their sizes and the shapes of their heads were different. One bird might have been a Scripps’s Murrelet, and the other a Cassin’s Auklet. But here they were, in the middle of the sea, together. An interspecies couple. Or at least, companions. Unabashed. We kept our distance not wanting to rouse them. Eight women in yellow and red kayaks, binoculars up, paddles down, watched two seabirds who watched us. No sounds, no ripples. On that summer day, it was a prayer. Sitting quietly all these years later in Mosier, where the rain has returned after months of sun, I see how safe I am. The silence here, whether the silence of scrub oak and blue sky in the dry season or fog in the wet season, is a presence tall enough and big enough to fill a cathedral spire. In it, I feel a connection to a goodness that is much bigger than noise on the news. The thing is that this safety is elusive. If I look, really look, the places and times that propel me are the interruptions, when birds from different species pair up, or when leaves are crazy loud as they land, or when I walk into the stagnant air of a church because I can’t bear how nasty people can be to each other, or I can’t figure out ways to make arguments that unite rather than divide. Those moments stand out, and the stand-out moments teach me the most. In eastern Oregon recently armed militants tapped into the long-standing anger of some rural Oregonians at liberals, government, and city folks. They forcibly occupied a wildlife refuge and drove a deeper wedge between preservationists, ranchers, townspeople, and indigenous people. In Mosier a recent derailment and explosion of oil cars highlighted a huge divide between residents and groups wanting to use the Gorge for their political or commercial ends. Oregon is dangerously divided. As the country is divided. This is a stand-out time, one that Audre Lorde, the black lesbian feminist poet demanded that we address: “It is not our differences that divide us. It is our inability to recognize, accept, and celebrate those differences.” And like Lorde, we have to be Warriors and walk toward conflict, use conflict as a spiritual tool through which to grow and become bigger than the conflict itself. When leaves fall in unusual ways, when people use violence to object to lawn signs or land preservation, or when birds make unlikely companions, we have to pay attention, really pay attention, and be smart. Figure out ways to have conversations with people who hate us. Be kind. Show respect. Develop a common language. We have to figure out how our differences can serve something greater. It’s time to get “out there” again. P.S. I’m going to contact the Rural Organizing Project which has helped facilitate difficult conversations for 23 years in rural Oregon. Another resource is the Oregon Humanities Conversation Project. Kate used to kayak a lot. 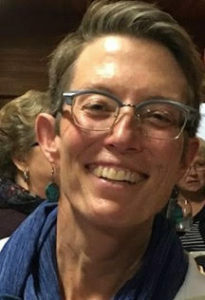 Now she rides a bike sometimes (when she’s lucky, with Kate Carroll de Gutes), and writes poetry and fiction more often, and loves volunteering with incarcerated women through Write Around Portland. She also coaches writing and leads workshops and salons. I’m finishing the final edits on the manuscript of The Authenticity Experiment which will be published by Two Sylvias Press in June 2017, and it’s hard to write and edit simultaneously. So, until December or so you’re going to hear from a variety of amazing writers. You’re gonna love their writing. Dark and light, both/and from voices you should know and will soon want to be following. But, if you miss my voice too much, you can always buy yourself a copy of Objects In Mirror Are Closer Than They Appear. Until then, be well. Thank you. I moved to Oregon in 1990, the same year I became a high school teacher. I remember those years, teaching in Gresham. Not exactly an enclave of diversity or tolerance. I remember having to hold space and objectivity with students whose intolerance horrified me. I can’t articulate exactly why your words here are providing comfort, but they are. Perhaps it is just to have reality validated, uncomfortable as reality is. Given all the lies and distortions we’ve been swimming in, that’s refreshing. I know the thrust of the writing is political, but what captures me right now is the imagery and atmosphere of the physical environment of western Oregon. It brought to mind the emotional satisfaction I felt when I first read Ken Kesey’s Sometimes a Great Notion. There is something soothing about that rain, that fog, that being drenched in the moisture of the Pacific Northwest.